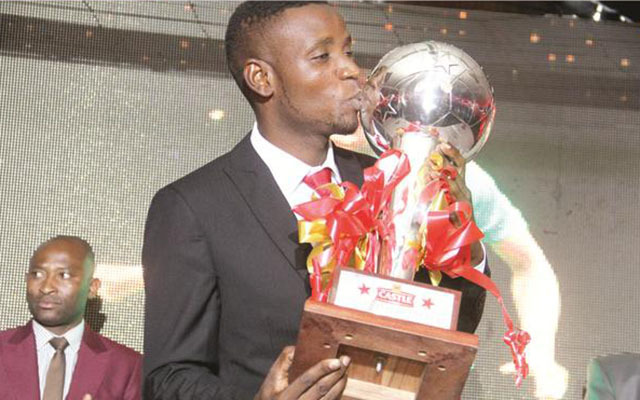 DYNAMOS newboy Raphael Manuvire says he is drawing a lot of inspiration from Soccer Star of the Year Rodwell Chinyengetere who scooped the country’s biggest individual prize after bouncing back from a horror injury. Chinyengetere played a key role to help FC Platinum power to an historic maiden top-flight league crown and was voted the best player in the domestic Premiership last year. Yet, six years ago, his career appeared over after suffering a horrific injury in a clash with Monomotapa goalkeeper Artwell Mukandi at Rufaro. A number of witnesses broke into tears as he was wheeled away into an ambulance. “That injury almost ended my football playing career. Not only was it nasty, but it was also delicate to the extent that I contemplated to quit,’’ said Chinyengetere. “But, somehow, thank God, I managed to lift myself up again. I just religiously adhered to the medical instructions which I had been given. And, it appears, Chinyengetere’s story is inspiring a lot of others. One of them is Dynamos’ new man Manuvire who nearly had his profession cut short after he was at the receiving end of a crude open-studded tackle from Chapungu defender Blessed Mbavarira which caught his shin on June 14, 2014 at Gwanzura while he was then turning up for ZPC Kariba. On that afternoon, he ran to a pass from right-back Peter Muzondo but ended up on the receiving end of a horror tackle by Mbavarira who later apologised for his tackle. Such was the brutality of the tackle, and the extent of the injury, the then ZPC Kariba coach Saul Chaminuka also started crying. Chaminuka, as fate would have it, even said in the post-match interview that Manuvire’s injury could cost his charges the league title which they failed to win on the last day of the race. But, like Chinyengetere, Manuvire has fought his way back into the game and the 29-year-old has now moved to the country’s biggest and most successful football club. “I am happy to have joined Dynamos. This is one of the biggest clubs in the country and I want to do well to help them achieve their goals,’’ said Manuvire. “As for my personal targets I should say, I was greatly inspired by Roddy (Chinyengetere) who after recovering from that nasty injury decided to join a big club which he helped win the title and he also won the Soccer Star accolade. “I was in almost the same scenario he found himself in. I almost decided to throw in the towel after that tackle. But somehow I lifted myself up and came back to the game. Warriors coach Sunday “Mhofu” Chidzambwa, who worked with the midfielder at ZPC Kariba and in the national team, recommended Manuvire to the Glamour Boys. Chidzambwa believes the midfielder, given the right platform, could explode into a big player in the domestic Premiership. “He is one of the best players I have worked with. With a little bit of hard work, he can easily win lots of prizes as an individual and can inspire any team to glory,” said Chidzambwa. Manuvire is expected to provide the spark in the DeMbare midfield this season and already his presence in the team has triggered a lot of expectations among the fans at the Glamour Boys. His last dance with a club from the Premiership, though, was not a successful one after he failed to make the expected impact which Harare City had hoped for when they bought him. Manuvire lost confidence and there were also reports of him having some disciplinary issues at the Sunshine Boys who were struggling at the time. Chidzambwa, though, believes the Glamour Boys, and the pressure that comes with playing for them, will bring the best out of Manuvire.